I have been following Bodegas San Alejandro for almost ten years now and I have rarely been disappointed. Their website uses the year 2003 as the moment when wine critics really took notice of their wines, so I feel particularly prescient in that I was “ahead of the curve” on “discovering” this little gem of a wine. I’ve watched the price for their wines steadily climb as more and more fans discover the wonderfulness in the bottle. At the current price point the wine is still a good value, worthy of consideration any day of the week. Bodegas San Alejandro is a cooperative consisting of more than 350 farmers, founded in 1962. The cooperative has almost 3,000 acres under vine in the minuscule town of Miedes, Calatayud, just north of the city of Madrid, within the Perejiles River valley. It is said that the relics of the real San Alejandro are kept nearby at a Franciscan convent. The Calatayud Denominación de Origen (DO) is located in the southwest corner of the Spanish province of Zaragoza, including 14,000 acres of vineyard in 46 small towns along the many river valleys. Most of the vines are planted at altitudes of 2,500 to 3,500 feet above sea level, on diverse soils ranging from chalk and limestone, to clay and marl. The region’s name can be traced back to the Moorish occupation of Spain, when the local governor, Ayud, had a fortress called a Qalat, where the town of Calatayud now stands. Wine has been made in the region for nearly 2,000 years. The climate of Calatayud is continental with hot, dry summers and very cold winters. While summer temperatures occasionally soar to 100°F and the winter months pose a frost risk, the vines generally enjoy a temperate climate year-round. Most of the vineyards have loose, rocky limestone soils with low nutrient levels and high lime content. With an average annual rainfall between 12 and 20 inches, the vines in this region have to work their way deep into the fractured soils to find the water and nutrients they need to flourish. Calatayud is best known for its red wines, which represent 83% of yearly wine production in the region. Of the 11 wine grape varieties approved for the DO (7 red and 4 white), Garnacha is by far the most widely planted with 55% of the overall total. Jammy, blackberry nose with spicy, black cherry and vanilla hints. Medium-bodied with moderate acidity and supple, well-integrated tannin – well balanced. Fruity palate, black cherry, anise and violet notes. Juicy. Moderate length – smooth and easy drinking – not for aging. Great value. Dark fruity nose, jammy with black cherry, blackberry and anise hints. Full-bodied with moderate acidity and supple, soft tannin – well balanced. Lush palate with lively fruit – cherry, berry and vanilla notes. Nice, refined structure. Long finish – smooth with layered complexity – spicy. Drinking well now and should hold for another 2 to 3 years in bottle. Personally, I thought that the straight-up Garnacha was the real value here, given that the premium Viñas Viejas didn’t offer enough of a step-up in quality to warrant the additional cost… In my humble opinion. I have the utmost respect for winemakers who make decisions to not produce certain wines in their portfolio during difficult vintages. It shows a true commitment to quality that frequently comes at a steep cost. 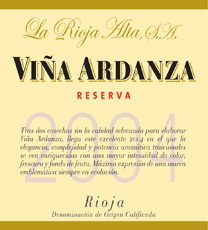 La Rioja Alta, S.A., the producer behind Viña Ardanza Rioja had such a situation. The two successive vintages following their blockbuster 2001 offering were abysmal, meaning that the flagship Viña Ardanza did not get produced. I sorely missed the wine, since it had become a favorite with the 1996 vintage many years ago. The good news is that the wine has returned with the 2004 vintage and it is back in fine form. The weather during 2004 really benefited the vineyards of La Rioja Alta, allowing for a slow, balanced growing cycle that led to fruit of superior quality. The wine itself is a blend of Tempranillo (80%) and Garnarcha (20%), the former being grown on 30-year old vines planted in Fuenmayor and Cenicero (Rioja Alta), the latter on old goblet-pruned vines in Tudelilla (Rioja Baja). The blending of these two sub-zones within the greater Rioja region produces a well-balanced wine with great structure and finesse. La Rioja Alta takes an interesting approach to the aging of their wine. Like traditional Reserva Rioja wines, the Tempranillo spent 36 months in American oak barrels with an average age of 4 years. Unlike more traditional wines, the Garnacha only spent 30 months in American oak that was 2 to 3 years old. The result is an interesting interplay between the more dried cedar-infused, leathery Tempranillo and a fresher, fruitier and brighter oaked Garnacha. The wine was finally blended and bottled in December of 2008. If you are a fan of classic Rioja, then this wine will put a big smile on your face! Bright, lively nose – spicy with vanilla, cedar and dried cherry hints. Medium-bodied with moderate acidity and firm, dry tannin – good balance. Sour cherry palate with black pepper, oak and saddle leather notes. Classic Reserva Rioja. Moderate length – smooth finish with an evolving, layered complexity. Drinking well now and should continue to improve for the next 3 to 5 years in bottle. At an average per bottle cost of $29.99 before customary discounts, this is a reasonable value and for lovers of classic Rioja, a real treat. In my History of Italy in Ten Glasses class I always reinforce the diversity and richness of Italian culture, which is the direct byproduct of the mixing of so many conquering/colonizing people on this verdant peninsular in the Mediterranean. Where other countries have specific areas devoted to grape growing and wine making, in Italy, the entire country is one giant vineyard. In Italy, wine is considered an integral part of everyday life. Wine is as essential to life – and the quality of life – as bread and olive oil. Contadini (local farmers) used to grow grape vines among other food crops, a practice referred to as: agricolturo promiscuo (promiscuous agriculture). People who visit Italy today quickly realize that the unsuspecting jug of wine served at a small roadside enoteca (wine house), is some of the most delicious wine they have ever enjoyed. It used to be that Italy had a corner on value-leading wines, most of which were straightforward, thirst-quenching quaffs meant to accompany hearty meals with friends and family. At least that’s how it worked at my house when I was growing up… And it usually happens this way in our home today, except the bottle is more likely something Spanish given their command of the high-value market. So, when a bottle of Italian wine appears that stresses value and pays homage to those classic characteristics of sun splashed fermented grape juice, I sit up and want to tell folks about it! Abruzzo is one of the major wine regions in Central Italy, ranked as the sixth most productive region in Italy. Abruzzo is home to numerous DOC and IGT wines, probably best known is Montepulciano d’Abruzzo. The wine is produced from the Montepulciano grape, a prolific red grape known for producing full-bodied, fruity wines and should not be confused with Vino Nobile di Montepulciano, a red wine made from Sangiovese in the Tuscan town of Montepulciano. Whenever I open Montepulciano d’Abruzzo I feel envious – what must life be like making wine of such genuine character, which is guaranteed to put a smile on your face every time you drink it? The 2011 Cantina Zaccagnini is classic Montepulciano d’Abruzzo. Rustic and earthy with a seductively lush mid-palate that seems to go on forever, all for an average cost of $14.99 per bottle before any discounts (I found it for $11.99/bottle). Great value in classic Italian wine! Rustic, earthy nose with currant, plum and dried lavender hints. Medium-to-full-bodied with moderate acidity and firm, well-integrated tannins – good balance. Dark fruit core with thick blackberry and cherry notes. Rich tasting. Long finish – smooth with a nicely layered finish – anise and saddle leather on the aftertaste. Drinking well now and should continue to evolve for another 2 to 3 years in the bottle. Great value. I shied away from the label for a while and recently picked up a few bottles to “re-acquaint” myself with the brand. Happily, I found the wines to be quite nice, albeit a bit more expensive than when I first tried them. I tried both the Russian River Valley and Central Coast Pinot Noirs and both were classic west coast Pinot – expressive, lively fruit with good mid-palate weight and supple, well-integrated tannins. Not terribly complex, but decidedly approachable and seductive. Bright, fresh and fruity nose with red berry, red currant and lavender hints. Pretty. Medium-bodied with moderate acidity and smooth, supple tannin – good balance. Youthful and fresh – bright cherry with raspberry jam notes. Moderate length – smooth and seductive – very nice. Drinking well now – not for aging. Lush nose with deep cherry, currant and violet hints – lovely. Medium-bodied with moderate acidity and supple tannin – very well balanced. Fruity palate with a dark fruit core – black cherry and rose attar notes. Long finish – smooth and seductive – really pretty. Drinking well now and should continue to improve with 2 to 3 years in bottle. Pinot Noir is a finicky grape that unlike Cabernet Sauvignon and Chardonnay is not a world traveler. Pinot Noir made its fame in the vineyards of the Côte d’Or, where it can command astronomical prices and produce some of the most beautifully complex wines on the planet. In Champagne, Pinot Noir is one of two black grapes that go into the production of some of the world’s most luxurious sparkling wines. In the US, the grape has found a few places where the climate and soil are particularly hospitable and produce some very noteworthy Pinot Noir. The area that has probably received the most press of late is California’s Central Coast. I’ve blogged about the Central Coast, specifically the Santa Rita Hills before (https://blog.musingsonthevine.com/2012/09/10/santa-rita-hills-update/), so my readers know of my deep appreciation for the region. We also have family in the area, so reasonably frequent visits have allowed for much exploration and enjoyment at the well over 350+ wineries in the region. While cruising the wine aisles recently I ran across what I will call a “blast from the past.” When I was first discovering wine, I made a point of visiting my favorite wine shops weekly to collect up mixed cases of various wines that the proprietors deemed “important,” or at least “instructive.” Among these early cases were several nascent wineries from California that were noted for genuine quality and had a bit of the pioneer in their hearts. 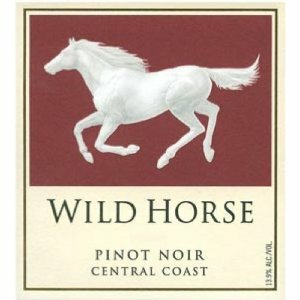 Among those cases were bottles of Wild Horse Winery and Vineyard Pinot Noirs. Wild Horse, located in Templeton California is in the heart of the Central Coast region, just south of Paso Robles. According to their web site (http://www.wildhorsewinery.com/Winery/Our-Story) they got their start making “our first wine in a plastic tub. Stirred it with a baseball bat. It was a senior project at Cal Poly that very quickly became a reason to be.” In 1981, they bought their first vineyards and produced their first vintage two years later. The name of the winery presumably is a tribute to the herds of wild mustangs that roamed over the hillsides in the area for decades. That, and possibly a tribute to Cal Poly’s mascot, a galloping horse. Wild Horse has come a long way over the last thirty years and despite being one of the “darlings” of the Central Coast, they have remained grounded, pun intended. We visited the winery a few years ago and found a commitment to the land and a commitment to quality, which pays homage to their humble beginnings. Are their more impressive wines coming out of the Central Coast? Perhaps, but for the money, Wild Horse is a good story and a very good wine. Lively, fruity nose with red berry, cherry and raspberry hints. Medium-bodied with moderate acidity and supple, well-integrated tannin – good balance. Lush palate with cherry, currant, rose attar and tea notes – Lovely. Moderate length with a deep, smooth finish – Seductive. Drinking well now – Not for aging. Paul Newman was one of my favorite actors. Like so many actors from his era, Mr. Newman displayed great diversity in the roles he undertook, gently evolving his characters appropriately as he aged. I was also impressed that he remained devoted to his second wife, Joanne Woodward for fifty years. 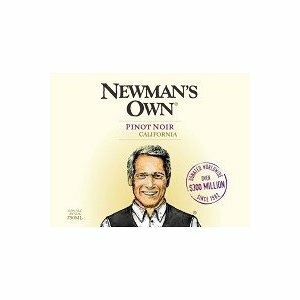 Another aspect of Mr. Newman’s life that I found admirable was his charitable work, most especially the co-founding of his Newman’s Own (http://newmansownfoundation.org/) line of foods in 1982. The brand started humbly with salad dressing, and has since expanded to include pasta sauce, salsa, soft drinks, snack products, frozen entrees and wine. With the foundation, Mr. Newman established a philanthropic policy where all proceeds, after taxes, would be donated to charity. As of today, the foundation has donated in excess of $370 million. Organizations supported by the foundation include philanthropic organizations, organizations helping children with life-limiting conditions, as well as organizations of empowerment and nutritional support (http://newmansownfoundation.org/what-we-support/). By and large, the products sold by Newman’s Own brand are quite good, with our shelves being lined by several jars of salsa, salad dressing and pasta sauce. However, I had yet to seriously dabble with his wine. Why? Well, the wine is inexpensive, California juice, which I rarely find appealing or interesting. Fresh, fruity nose with bright red berry, raspberry and violet hints. Medium-bodied with moderate acidity and moderate, supple tannin – good balance. Sour cherry palate with rose attar and blackberry notes. Moderate length – smooth finish – easy drinking. Not for aging – good value. Bright, fruity nose with cherry, floral and fresh, herbal hints. Medium-bodied with moderate acidity and moderate tannin – good balance. Soft palate with fresh, red berries on the palate. Moderate length with a smooth easy finish. Drinking well – not for aging. Good value.